Speaker Academy students, note: this movement is about rocking the boat, not sinking it. (Helen says it’s about “rocking the boat without falling out.”) Think about that, seriously. Would you like to develop your ability at that? Would you like to hear from people who are effective at it? 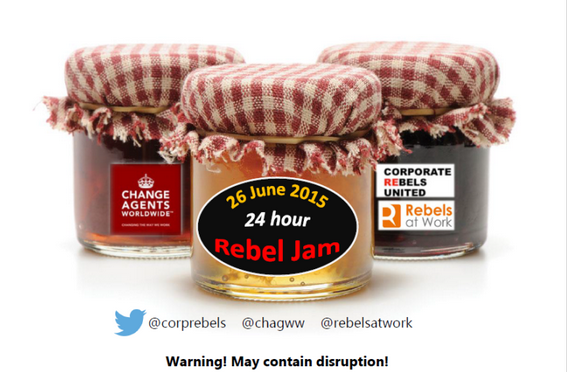 Rebel Jam is a live 24-hour “jam session” (via Webex) with speakers from around the world, particularly from three organizations: Corporate Rebels United, Rebels at Work, and Change Agents Worldwide. My half-hour session is at 4:30 pm Boston time. Below is the information each of them posted on their websites (e.g. the Corporate Rebels United post). Register, browse the subjects, listen live when you’re awake, and watch the recordings later. On Friday, June 26 at noon Central European Time, we will kick off our 24 hours of speakers sharing stories, observations and emerging practices about creating change and reshaping the future of work. Proudly sponsored by RELEVENTS, committed to enacting a movement of positive change in the business community.